Juvederm has fast become one of the more popular anti-aging facial cosmetic procedures for people who want an alternative to facial cosmetic surgery. The treatment provider will provide all information about various aspects of Juvederm injectable procedure during the initial consultation. The primary objective of a provider should be to guide a patient to make an educated choice weighing all factors, including the costs of the procedure. Fabulous and righteous facial plastic and reconstructive surgeon Dr. Eric Yavrouian provides Juvederm filler injections to patients in Glendale, Pasadena, Burbank, Greater Los Angeles, Beverly Hills, CA, and other suburbs and neighborhoods in this section of the country. Juvederm facial anti-wrinkle procedure is significantly more cost-effective compared to cosmetic surgery as well as laser, ultrasound, or some other facial rejuvenation procedures. The process does not involve anesthesia, medical exams, prescription medicines, or expenses after the procedure in most cases. Furthermore, Juvederm results are more sustainable when compared to some other types of dermal filler injectables. Most of HA-based injectables will provide results for approximately six months, but Juvederm patients can see the results for up to one year. Therefore, Juvederm can be more cost-effective than similar non-surgical facial anti-aging alternatives. The real monetary amount of the Juverderm treatment will most probably differ between various practices and patients. The location where the patient receives the treatment is one of the vital factors impacting the cost. This happens because the living cost index typically differs between cities, impacting the average costs of most goods and services. The expertise, qualifications, and recognition of the injection provider will also affect the cost of the treatment. Furthermore, different practices offer varying standards of care and services to patients. Juverderm syringes are available in varying sizes to enable the treatment of various parts of the face. Lesser amounts of medication will be required for smaller areas which would decrease the costs. For example, if the patient needs Juvederm to treat smile lines around the lips, it may require just one or two syringes of the product to carry out the treatment. If the fine lines around the lip line require treatment, these need smaller volumes of Juvederm gel. At the time of the initial consultation, the patient should voice any concerns pertaining to the monetary amount and other facets of the treatment. Patients should understand the costs associated with alternative treatments and compare these financial ramifications with Juvederm to be able to make an educated decision. Some patients may like to combine Juvederm injectable treatment with other facial rejuvenation cosmetic surgery or non-surgical procedure. This could make them eligible for a more competitive package price. As Juvederm is performed mainly as an elective procedure, the costs are not covered under insurance. However, a patient will typically be able to avail various financing options such as personal borrowings, bank loans, credit cards, and financing through medical care finance providers. 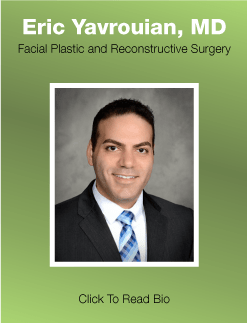 Kind and accomplished facial plastic and reconstructive surgeon Dr. Eric Yavrouian receives patients from Glendale, Pasadena, Burbank, Greater Los Angeles, Beverly Hills, CA, and nearby areas across the landscape for Juvederm dermal filler treatment.